Chevrolet Volt helped revolutionize the plug-in hybrid segment , Chevy’s eco-friendly hatchback is a great choice for people who desire to live a green lifestyle , While the Volt’s main selling point is its strong fuel economy, It proves to be a pleasure to drive and it is a fine choice for most shoppers . 2017 Chevrolet Volt has the automatic braking technology & the adaptive cruise control , A new drive mode is also featured on the model to make 2017 Volt more appealing , It continues to separate itself from the pack , Not only is it a lot quicker than the previous generation but it has a longer all-electric driving range too . Chevrolet added some safety technologies , With a starting price of $33,200 , A new driver assistance is available in 2017 Chevrolet Volt , You can charge it for free at work that means fewer gas bills , Chevrolet Volt range-extended electric car scores higher on owner satisfaction than any other vehicle . 2017 Chevrolet Volt ranking is based on its score within the Compact Cars category , Currently Chevrolet Volt has a score of 8.6 out of 10 , 2017 Chevrolet Volt touts impeccable safety scores although its rear seats are a bit cramped and it has a higher price than most of its rivals . 2017 Chevrolet Volt offers impressive all-Electric Driving Range , Hybrid’s all-electric mode makes it a wonderful commuter car when activated , Although 2017 Chevrolet Volt offers an advertised all-electric driving range of 53 miles , It can travel farther in the real world . When the hybrid battery becomes depleted , Gasoline engine will offer the necessary juice , You can run errands without consuming any fuel easily , 2017 Chevrolet Volt can be recharged by using the regular 120-volt home outlet easily . It takes around 13 hours for the battery pack to be fully replenished , The 240-volt system will drastically reduce the battery’s charging time but the regenerative braking system helps store the extra energy while you drive . 2017 Chevrolet Volt offers a snappy acceleration , Unlike a lot of hybrid cars of the past , 2017 Chevrolet Volt is far from being a slow car , It recorded the 0-60 time of 7.1 seconds , that is a bit quicker than the competition . The vehicle’s surplus of torque makes it feel lively in everyday driving situations , If you crave a more stimulating driving experience , You can activate the hatchback’s sport mode . 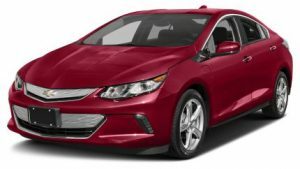 2017 Chevrolet Volt is very pleasing to drive , You will grow to appreciate its smooth driving dynamics , Suspension system excels at keeping the vehicle stable and poised , Like an actual luxury vehicle , The Volt rewards you with a very comfortable ride , Its well-insulated cabin keeps the wind and road noise to a minimum . 2017 Chevrolet Volt includes a graceful styling , It does not blend into the crowd , Its sleek exterior styling is destined to catch your eye , The hatchback’s road-hugging stance gives it an especially sporty profile , LED headlights and taillights come standard . While the base model is appealing , Premier trim comes equipped with a more striking set of 17-inch alloy wheels , Many unique colors are offered , including kinetic blue & silver ice . 2017 Chevrolet Volt comes with a 4G Wi-Fi Hotspot , It is a great feature which you won’t find in plug-in hybrids , If you are traveling to a new location or going out for lunch , you will have a strong Internet connection , Your passengers can take advantage of Wi-Fi hotspot too . Two great technology features which come standard in the Volt are a built-in Wi-Fi hotspot and the Chevy Remote Link app , that turns your smartphone into a key fob , allowing you to lock , unlock and remotely start the Volt . The wireless device charger gets rid of all those pesky charging cables by allowing you to simply place your compatible phone on a charging platform , Some of the other nice features offer the navigation , the wireless charging pad , the automatic parking assist and the heated seats . The Volt comes with satellite radio , Bluetooth , two USB ports , the six-speaker audio system , the wide 8-inch touch screen & the rear-view camera , the automatic climate control , The remote start & proximity key , Android Auto and a built-in Pandora streaming app , so , The users can integrate apps they’re already familiar with . 2017 Chevrolet Volt has a loaded base model , iPhone users will use Apple Car-play on a daily basis , The customizable gauge cluster makes your driving experience even more satisfying , If you live in an urban area , the automatic parking system will come in handy . 2017 Chevrolet Volt presents plenty of cool options , If you demand more luxury , there are plenty of options to choose from and the premium Bose sound system is a main upgrade from the standard unit . 2017 Chevrolet Volt is a safe vehicle , You can depend on it to provide great crash protection , Because of the vehicle’s extremely quiet operation , It is designed to alert unknowing pedestrians , Available on Premier model . The automatic braking technology gives you an extra peace of mind , Some of the other driving aids include the lane departure intervention , The adaptive cruise control and blind-spot monitoring . Owning the plug-in hybrid vehicle such as 2017 Chevrolet Volt is a unique experience , While the other drivers must frequently stop to refuel , you can continue on with your day , When traveling in the all-electric mode , Absence of the engine noise makes the hatchback feel futuristic . 2017 Chevrolet Volt presents a few changes to standard and available features only , Newly standard is the Teen Driver management system , full-speed adaptive cruise control and forward automatic emergency braking are now available with the Premier trim . There is more cargo space in the Volt than in most plug-in hybrids , In a pinch , We can fold down the Volt’s 60/40 split-folding rear seats to fit long objects , Although with all seats in use , we shouldn’t have a problem with two large suitcases and a couple carry-on bags , As the Volt is a hatchback , loading and unloading is easy . Volt’s power-train consists of a pair of electric motors , The lithium-ion battery, and a 1.5-liter four-cylinder engine , Together , they produce 149 horsepower , that is enough to give the Volt fairly good performance , Volt can make it about 53 miles before the gas engine kicks in , It returns 106 mpg-e , That is still very good for a plug-in hybrid . Volt is quite fun to drive for a plug-in hybrid , Its handling is composed around turns , even with its low-rolling resistance tires , The ride , while not too soft , absorbs the bumps in the road well enough to not feel harsh. Volt uses regenerative brakes like all plug-in hybrids and the electric cars , This system uses the electric motors to slow the car down and it uses that energy to recharge the battery pack , before transitioning to the traditional friction brakes to bring the car to a stop and this transition is quite smooth . You can increase the regenerative braking input from the electric motors , In some instances , this allows you to drive in stop-and-go traffic without ever touching the brake pedal , as merely lifting your foot off the accelerator slows the car significantly . Volt earns the highest possible crash test the scores across the board from both the National Highway Traffic Safety Administration and the Insurance Institute for Highway Safety , The only other hybrid which touts the same score is the Kia Optima Hybrid . There are Safety Features in this vehicle such as rear-view camera and the Teen Driver management system , that provides the parents with the report card of their teen’s driving habits , You can set volume & speed limitations on the car with this system and On-star emergency notification services also come standard . 2017 Chevrolet Volt is not the best family vehicle , If you are in need of a spacious family car , Its cramped backseat does not offer nearly enough room for most adults , On the plus side , the rear seat can be folded down to provide extra cargo space . 2017 Chevrolet Volt does not come with the power seats , The top-of-the-line Premier model can not be equipped with the power seats , You should manually pull the lever to adjust your seat and this issue takes away from the Volt’s luxuriousness . Some drivers do not like its quietness , While a lot of the drivers will love the hybrid hatchback’s quiet operation , there are others who will prefer the rumble of the traditional engine , Some onlookers may not hear you coming , The good news is that Chevrolet installed the alert feature for the pedestrians . 2017 Chevrolet Volt is very expensive , The rear seats are cramped and anyone sitting in the middle seat must straddle the center console , that extends from the front all the way to the rear-seat cushion , If you need better rear-seat room , the Bolt makes a better alternative . We will find many hard plastic throughout the Volt’s cabin , Although Volt’s interior design is attractive , The Volt’s gauges are easy to read and controls are straightforward , including the standard 8-inch touch screen , The Volt also now employs physical buttons that are no longer touch sensitive .